Penwortham Glass Ltd was originally set up in Penwortham but the business is now located in Hutton & Longton. We cover the whole of the Northwest of England. The company's managing director is Mick Walmsley. Having started off as a time served joiner Mick decided to go back to nightschool to add more strings to his bow and further his construction knowledge. Having worked in surveying / loss adjusting roles for various companies and focusing on the sector for many years, Mick opened up his own company in 2003. Having previously worked for a large blue chip company liaising closely with major Ins Companies, Mick has the experience to manage the company through these turbulent and testing times. He states, we liase with insurance companies on a daily basis and are on a lot of their approved contractor panels, it is always wise to call us out 1st to assess damage to a conservatory to see if it is covered! Sometimes we can validate it as Storm Damage there and then for the Insurance Company and speed up the repair process. 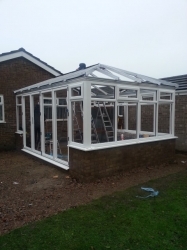 Due to customer demand, over 70% of our work is now on Conservatories, mainly Roof Repairs, Panel Upgrades or New Roof installations. We offer a variety of options when it comes to new roofs. From Multiwall Heatguard Polycarbonate to the latest tinted glass we do the lot at very competitive prices. We try to keep at the forefront of conservatory technology. We also offer a variety of tiled warm roof options including Supalite and Guardian. 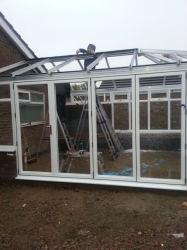 With specialist equipment and fully qualified staff, Penwortham Glass Ltd is able to offer a professional and reliable service to customers. We will provide our clients with a free advisory survey and quotation. 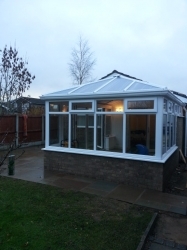 We can discuss which style of conservatory or roof would best suit your home and your requirements . We are very flexible when it comes to carrying out our work, enabling our clients to carry on their daily work schedules. Our aim is to stay competitive, stay busy and customer satisfaction is of highest priority.